Kanon Mori, Yuki Sakura, Hinako Kuroki and Jun Amaki have been following the Nikkei 225 stock average obsessively since Prime Minister Shinzo Abe took office in December. The oldest of the foursome is Mori, but she is still only 23. The youngest is Kuroki, 16 and still in high school. None of them are studying for a degree in economics, let alone playing the stock market. Instead, the four are members of a new idol group, Machikado Keiki Japan, and stocks play an important part in their performances. “We base our costumes on the price of the Nikkei average of the day. For example, when the index falls below 10,000 points, we go on stage with really long skirts,” Mori explained. The higher stocks rise, the shorter their dresses get. With the Nikkei index ending above 13,000, the four went without skirts altogether on the day of their interview with The Japan Times, instead wearing only lacy shorts. While some have raised eyebrows over the group’s daring concept, Mori explained that they are merely letting the economy take charge of how they dress — mimicking economic trends of the past. The miniskirt boom of the 1960s coincided with Japan’s strong economic growth in the era, she pointed out. The disco boom of the late 1980s also saw women dancing in short skirts in Tokyo discos as the Nikkei kept breaking record highs until the collapse of the bubble economy ended its run above 38,000. The notion that a strong economy results in shorter dresses on women is dubious at best, but instead of trying to piece together an elaborate “butterfly effect,” members of Machikado Keiki Japan have chosen to condense the process and just let stock prices, which have spiked upward on Abe’s watch, directly decide the length of their uniforms. Machikado Keiki Japan (roughly translated as Economic Conditions on the Streets of Japan) released their debut single, “Abeno Mix,” on April 7. It pays homage to Abe’s ultraloose economic policies that have been dubbed “Abenomics” by the media. The group’s fans — who not surprisingly are 95 percent male, from high school to their 50s — have special chants that they perform during the song’s interlude. “They yell out economic terms during our concerts, something like Shinzo Abe! Monetary policy! Private investment!” Mori said. “Economics are often just about the mood of the people, which is something intangible,” Sakura, 20, pointed out. The University of Tokyo student hopes that her group’s concept and performances, as well as their music, can add to the positive domestic vibe that is beginning to heat up. Stocks are at their highest in nearly five years after an Abenomics-driven hammering of the yen and a newly compliant BOJ sent investors flocking to sure bets in exporters. Abe also still enjoys a high support rate, although he won’t reveal his true economic policies until June. But Sakura warns that much more needs to be done for the public to be able to enjoy the good economy. “Previous administrations were overly conservative and couldn’t push forward huge changes. We expect the administration to implement drastic changes that will stimulate individual spending,” she said. The young ladies are eager to see the economy get on a roll, although they have yet to decide what their costumes will look like if the Nikkei tops 15,000. “The image I have of the bubble economy in the ’90s . . . is people dancing around and exposing their body,” said 17-year-old Amaki, who was born in 1995, well after the bubble imploded. “I think Japan needs to seek strong economic growth, but it should be sustainable,” she added. Kuroki said she had no interest in economics before joining the group. Much of Machikado Keiki Japan’s future remains uncertain at this point, just like the economy. Members say they could call it quits if the Nikkei reaches a certain level, or if it falls too low. But as an idol group, their eyes are set on cheering up their fans and maybe even stimulating the market with their anthem and their performances. 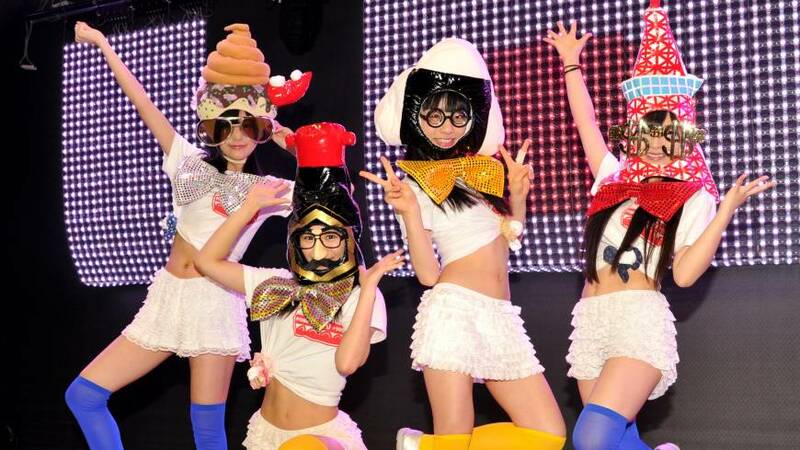 “We don’t see AKB48 and other idol groups as our rivals,” Mori said.